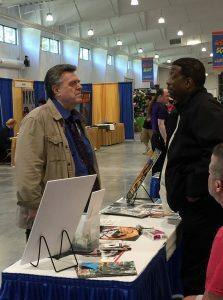 Priest has been hitting the convention circuit this summer, including Terrificon where a gruff police captain told him he’d crossed the line once too often, but he knew he was a week from retirement and didn’t have to put up with that any…wait, no, that’s Neal Adams. This entry was posted on Monday, September 3rd, 2018 at 8:35 pm	and is filed under About Me, Comics. You can follow any responses to this entry through the RSS 2.0 feed. You can leave a response, or trackback from your own site. This was a great issue and if DC ever does a Batfamily book I hope you gets it. Awesome! Always glad to hear updates. And Deathstroke #35, out today, the finale of Batman v. Deathstroke, is, of course, fantastic! I’m so thrilled that this arc ends so amazingly, and also that we’re getting Arkham (and editor Alex Antone says the arc after Arkham is even bigger! ), getting back to where we left Slade, with the hallucinated voice of Billy in his head, his family scattered to the winds, and his allies driven away. We Damian fans owe you apology ..sorry Mister Priest. Wonderful arc, as a Damian fan I’m pleased. Now other fans need to apologize. Looking forwars to Arkham. I have to wonder, with its themes similar to King’s Heroes in Crisis, was there coordination? I hope you will keep working on Deathstroke for as long as you wants. Priest just did Damian a huge favor with the ending. Give this guy a Batman book DC. Can you solve some doubts I have about this issue? Why did Talia fake those tests years ago? What does Talia mean at the end? She regrets having had a child with Bruce and wants to have another one with Slade? So why not have it first with him before with Batman? The truth is that their relationship has surprised me in these 6 issues, how would you describe the relationship between Talia and Slade? Love or manipulation? continued Kudos, Mr. Priest! In Detroit, the Great Lakes Comic Con and the Motor City Comic Con would love to have you as a guest next year! Priest, will you be making your way to NYCC? I’m going to be cosplaying as Rebirth Deathstroke and would love for you to see it first hand! You wouldn’t believe the amount of people I asked at SDCC if you were in attendance before someone on twitter finally told me ‘no’. Come make your way to New York!